The Midlife Kitchen features recipes that support healthy aging without sacrificing that all-important yum factor. Our relationship with food, like all relationships, changes over time. Earlier in adulthood, we often grab low-nutrition convenience foods as we chauffeur kids around or work through our lunches. We don’t always consider what these empty calories are doing to our bodies. That’s the sort of relationship with food that Mimi Spencer and Sam Rice were having – until the British co-authors hit midlife and started to think about the ways that the ingredients in their food might be an investment in their future health. As we get older, our metabolism slows, and our hormone levels drop. Our muscle mass and bone density decline. The Midlife Kitchen: Health-Boosting Recipes for Midlife & Beyond focuses on the nutrients we need to support these changes so we can celebrate our bodies, instead of sabotaging them, going forward. This book isn’t about magic anti-aging superfoods – although they are included. Rather, it aims to present a healthy balance that includes plenty of vitamins and minerals, lean proteins and less processed carbs. Some recipes feature probiotics, while others are high in calcium or put a spotlight on phytoestrogens. Are the claims in these pages credible – can eating fennel really reduce inflammation, and can chicory really safeguard your digestive tract as you journey through the second half of life? The authors acknowledge that nutritional research is ongoing. Before linking an ingredient to a health benefit, they considered the volume and quality of existing evidence. They also sought approval from registered dietitian and nutritionist Dr. Sarah Schenker. 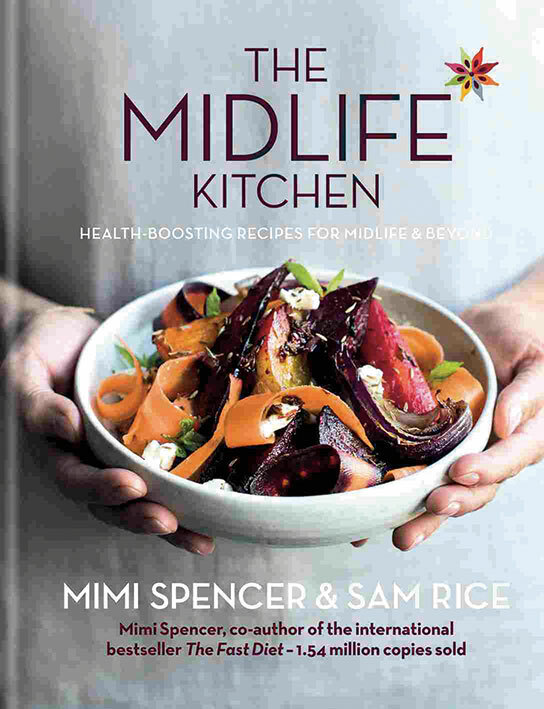 The book is meant to support our nutritional needs, but first and foremost, The Midlife Kitchen has a strong yum factor. Eating should be a lifelong pleasure, after all. And if nothing else, the appealing descriptions of Balinese Yellow Chicken Curry and Walnut, Watercress & Pecorino Pesto will motivate us to try more combinations of diverse ingredients, providing the novelty and variety that we crave as we get older. (Certain long-time favourites, like chocolate mousse, will still grab our attention, however healthy their take is!) The recipes are intentionally uncomplicated and practical, with easy-to-source ingredients. A list of must-have items to keep in your “midlife larder,” like olive oil and flaxseeds, is also supplied. It would be nice if the print was larger – after all, our eyes change at midlife, too. And it would be helpful to have total prep and cooking times listed. If you need to know which recipes co-ordinate best with your food allergies and sensitivities, you’re left to figure that out on your own. But we like the “midlife hacks” – tips for choosing ingredients or using substitutions. And the gorgeous food photography has whetted our appetites. If you find your relationship with food could use a little couples counselling, The Midlife Kitchen will be a valuable addition to your cookbook collection. Why We Love It A staple Ayurvedic healing food, this complete-protein meal nourishes and soothes the digestive system. 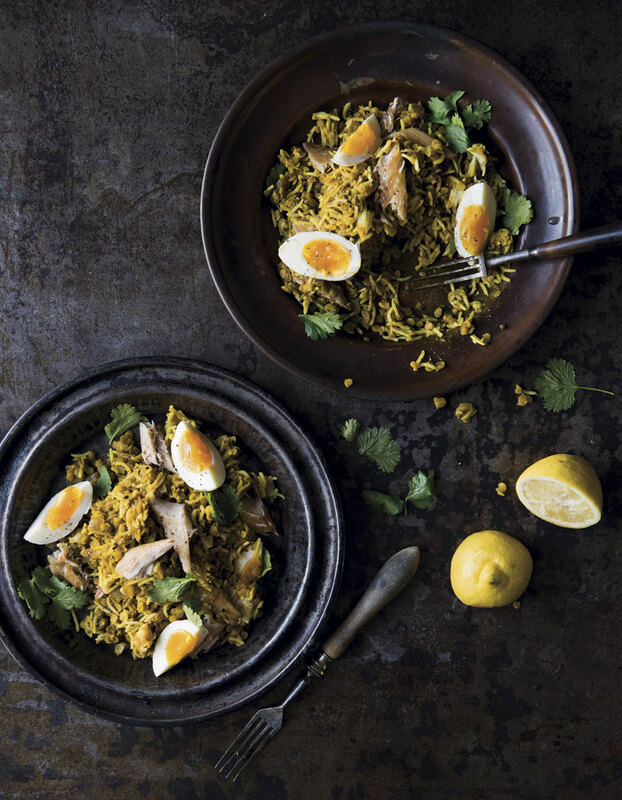 It’s essentially a midlife take on kedgeree – traditionally made just with rice, but here we have added red lentils to improve the texture and boost the health credentials. — great for your heart and joints. Heat the oil in a large skillet, add the mustard seeds and nigella seeds, and fry for a couple of minutes, taking care not to burn them. Add the remaining ground spices and Spice Mix and fry for another 30 seconds. Add the onion with a splash of water and fry gently for 2 to 3 minutes, until softened. Stir in the lentils and coat with the fragrant spice mixture, then add the broth, bay leaf, and cinnamon stick. Bring to a simmer and cook for about 15 minutes, until the lentils are tender. Meanwhile, cook the eggs in a small saucepan of simmering water for 10 minutes until hard-cooked, then plunge into a bowl of cold water and let cool. Peel and quarter the eggs. Stir the cooked rice into the lentils, then add the fish flakes and gently heat through. Add the lemon juice and season. Spoon the kitchri into 2 bowls and top with the hard-cooked eggs. Sprinkle with cilantro leaves, season with pepper, and serve with lemon wedges. Combine all the ingredients and store in an airtight container for up to 6 months. 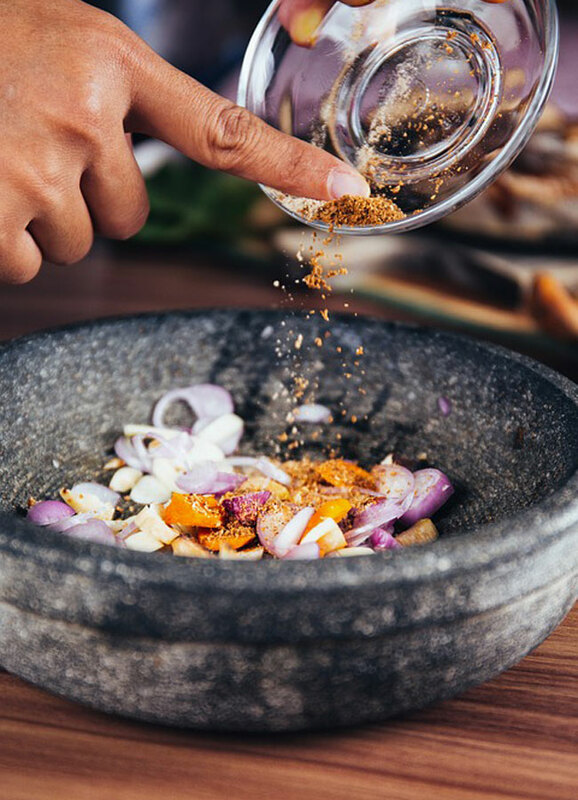 Spices lose their potency (and some of their health benefits) over time, so don’t keep them longer than six months. Why We Love It Deliciously decadent, and not a drop of heavy cream in sight! sugar – use 3 tablespoons if you prefer a truly dark spoonful or 4 if you have a sweet tooth. Do serve in small bowls or glasses, though; this is surprisingly rich and indulgent and will easily satisfy six chocoholics. Health tip: According to a study by the University of Copenhagen, semisweet chocolate is far more satisfying than milk chocolate, lessening our cravings for sweet, salty and fatty foods. Melt the chocolate in a heatproof bowl set over a saucepan of gently simmering water, making sure the bowl does not touch the water, stirring occasionally. Alternatively, melt the chocolate in a microwave. Let cool slightly. Meanwhile, whisk the egg whites in a clean bowl until stiff peaks form. Gently fold in the sugar, a spoonful at a time. Mix the yogurt into the melted chocolate (it will start to thicken immediately, so work fairly quickly), then fold in the egg white mixture, a third at a time. 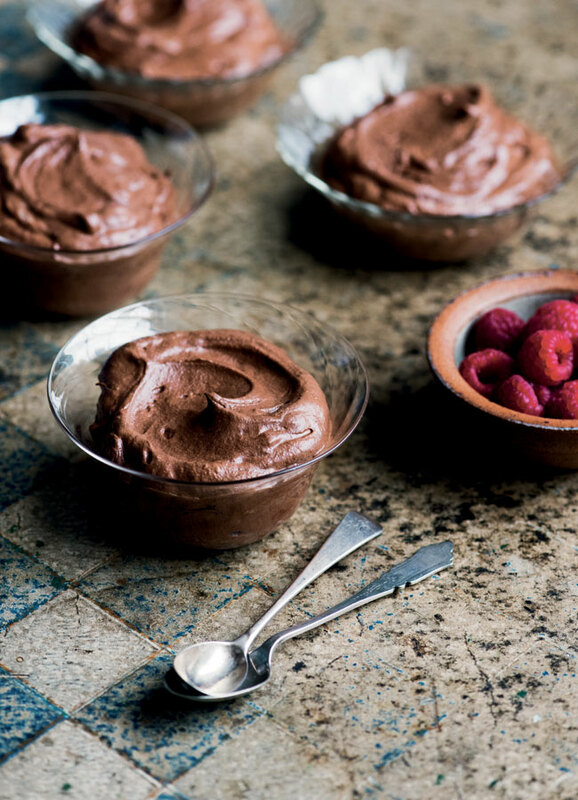 Spoon the mousse into 6 small bowls or glasses and serve immediately or chill to serve later (we give you 5 minutes!). Serve with fresh raspberries and small spoons. Excerpted from The Midlife Kitchen: Health-Boosting Recipes for Midllife and Beyond. Text copyright © Mimi Sencer & Sam Rice 2017. Reprinted with permission of Octopus Publishing Group. A version of this article appeared in the December 2017/January 2018 issue with the headline, “A Recipe For Midlife,” p. 68.